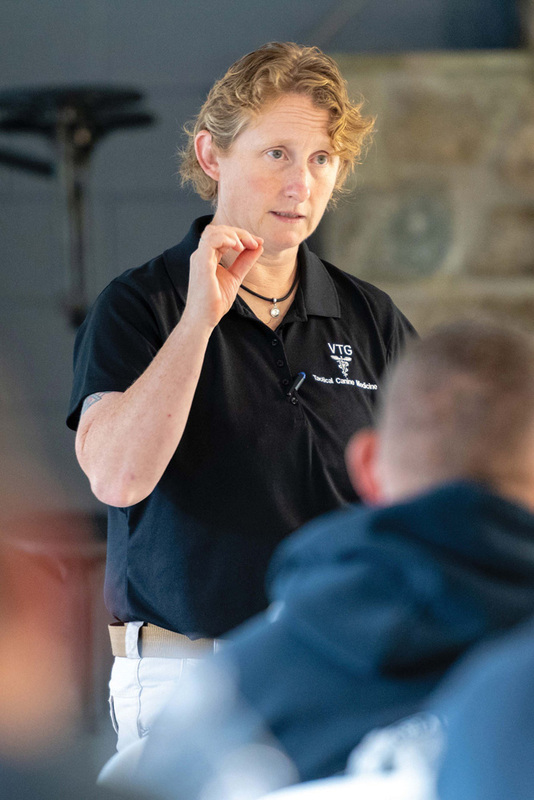 Dr. Janice Baker teaches the tactical canine medical training class held at Camp Barnes back in October. More than two dozen officers attended the free class, for which OVPD Cpl. Justin Hopkins raised more than half the funds. 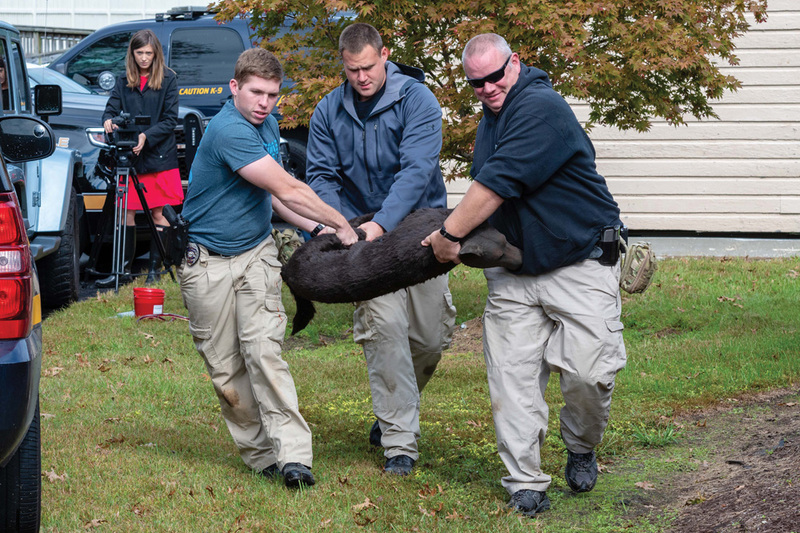 Officers from around the state team up in three-man teams to practice what they learned in scenarios created by the Veterinary Tactical Group, using life size dog mannequins. Here, officers carry a ‘dog’ from an active crime scene to a safe location before administering procedures taught in class. When Ocean View Police Department’s Cpl. 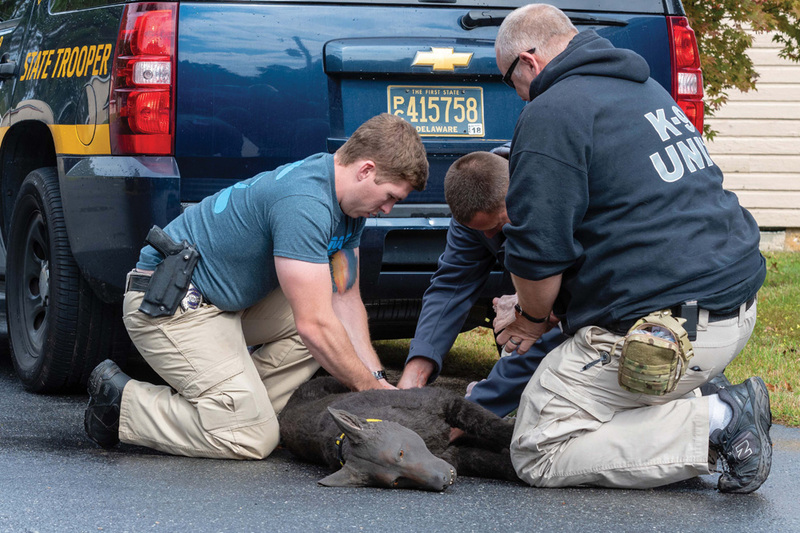 Justin Hopkins saw a need for other K9 handler officers in Delaware to get medical-related training for their four-legged partners, he decided to do something about it. “They’re our family,” said Hopkins of his partner, Hardy. Hopkins, who received the training a few years ago, organized a fundraiser in August with the hope of raising $25,000 in order to provide two-day tactical canine medical training to the 50-some K9 officers throughout the state. With more than half of that goal reached, an initial class was taught at Camp Barnes in mid-October, to 25 K9 handlers. Participating agencies included Delaware State Police, Laurel Police Department, Dover Police Department, Department of Corrections and even the Sussex County Paramedics. “That’s me being a little bit selfish, because they’re the ones who are going to be on-scene when my dog gets injured,” said Hopkins of the paramedics. “Because of Justin’s fundraising efforts, we were able to make this class free for everybody,” lauded Ocean View Police Chief Ken McLaughlin. 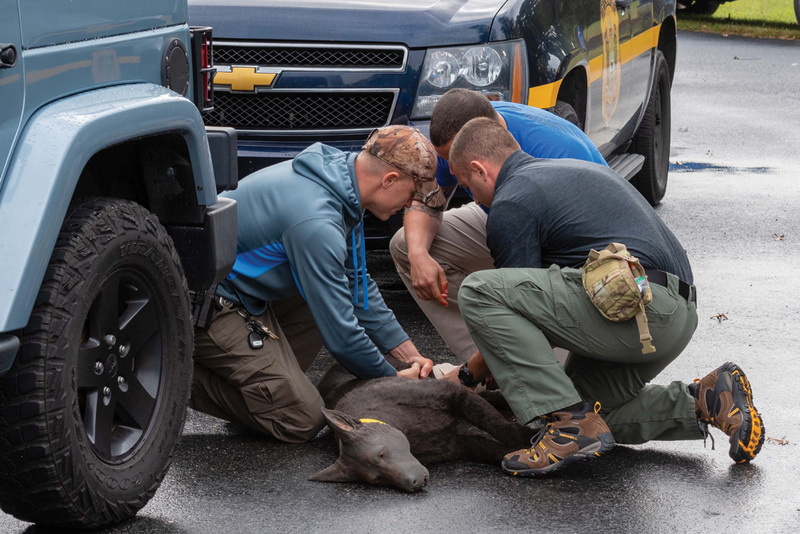 Hopkins raised $16,000 initially and was able to host one training session with Veterinary Tactical Group for 25 officers from throughout the state. “We are teaching them tactical medicine for working dogs. It’s different than first-aid,” explained Dr. Janice Baker, owner of Veterinary Tactical Group. 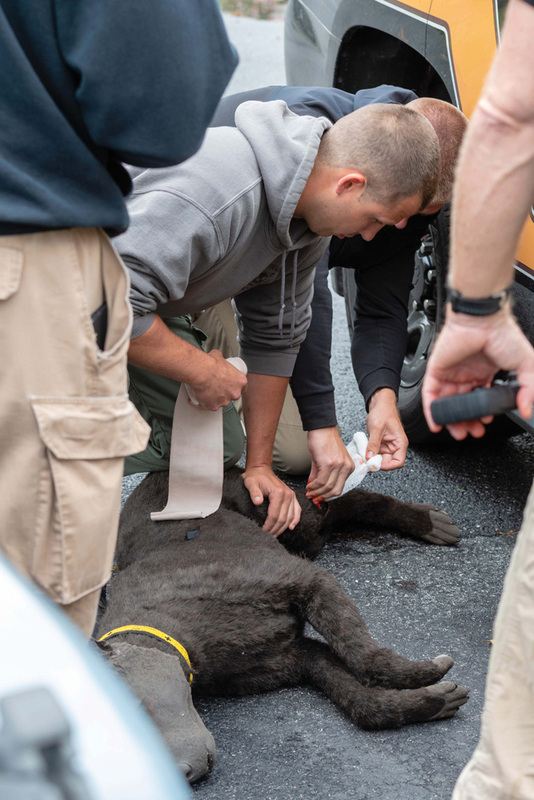 “It’s treating dogs with serious life-threatening injuries that have occurred in the line of duty in more tactical situation… So, gunfire, stabbings, things like that, when there’s still an active threat. Baker, a veterinarian, has a military special-operations background said that 15 to 20 law-enforcement dogs are killed in the line of duty each year. Veterinarians, said Baker, don’t get specific training on how to treat dogs with field wounds. “We get very little emergency training in school. You can specialize in emergency medicine and surgery after you graduate and are out of school, but there’s no express program for this,” she said, noting that they are trying to take the concept to civilian veterinarians. Baker’s team of about 20 instructors works in various fields, including paramedics, dog handlers and veterinarians. Most of them have a military background. “When I was in the military, my colleagues and I were tasked with developing a tactical combat casualty care for dogs. I did that for several years in the military as my job — training K9 handlers,” Baker said. 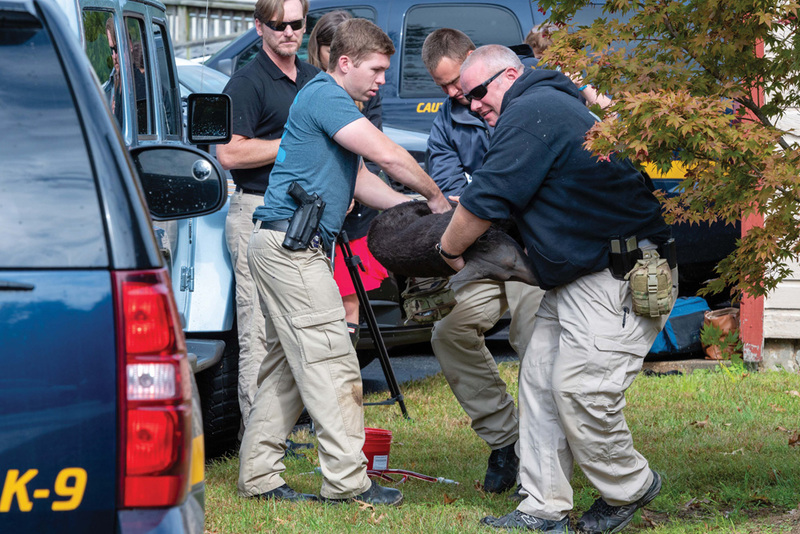 Over the course of the program, K9 handlers had classroom time, but then were expected to take that knowledge to the dogs — using life-sized canine mannequins. “Some dogs can have serious injuries but they don’t react right away because the physical effects haven’t taken affect. Those dogs may run off — they may look perfectly normal, sometimes they’ll look agitated, sometimes they’re unconscious and not moving at all,” said Baker, noting that the training simulates varying scenarios, including dogs becoming injured and running or becoming combative. Hopkins said the human equivalent to the program is Tactical Combat Casualty Care (TCCC). Hopkins said while the 25 officers will receive the two-day training, it will be important for them to practice the skills they learn. Hopkins is still in the process of fundraising for a second class with Veterinary Tactical Group to train the remaining K9 officers in Delaware who have yet to receive the specialized training. “At the end of the day, it’s a relief that we at the police department were able to get to this point and put it together,” he said. Currently, the department is continuing its fundraising efforts with a raffle for a 2018 Jeep Wrangler donated by Preston Automotive Group. The drawing will be held on Saturday, Dec. 22, at 1 p.m. at the Millsboro CDJR. Tickets cost $10 each or $25 for three, and are available for purchase at the Ocean View Police Department on weekdays from 8:30 a.m. to 4 p.m. If less than $26,000 is raised, the raffle will be a 50/50 cash split. “A Jeep is a great beach vehicle!” Hopkins emphasized. Donations may also be made at the Ocean View Police Department or through Fraternal Order of Police Lodge 16. The Ocean View Police Department is located at 201 Central Avenue in Ocean View. For more information about the department’s fundraising efforts, to make a donation or purchase raffle tickets, call (302) 539-1111.